The signs were there for Oscar Taveras entering his first Double-A season, but for Barret Loux, the breakout numbers have the Texas League buzzing. 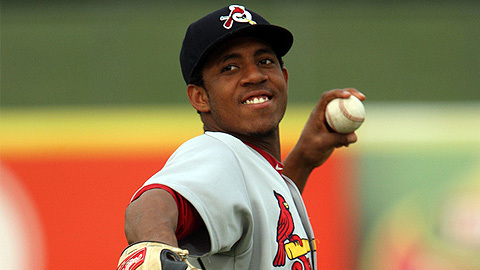 Loux, a first-rounder in 2010 who ended up signing with Texas as a free agent, was named the league's Pitcher of the Year after going 14-1 with a 3.50 ERA in his first 24 starts for Double-A Frisco. A midseason All-Star, Loux began the season 10-0 through May and has struck out 99 batters in 126 innings. Taveras, who hit .386 last year at Class A Quad Cities, has put together another strong season to earn Player of the Year honors. St. Louis' No. 3 prospect is batting .322 with 22 homers, 89 RBIs, 10 steals and a .380 on-base percentage for Springfield. The league revealed its postseason squad on Tuesday, selecting notable prospects like Frisco third baseman Mike Olt, who reached the Majors this year, along with fellow RoughRider Jurickson Profar, a shortstop currently ranked as the Rangers' top prospect. Frisco also sent outfielder Engel Beltre to the roster, joining Taveras and Corpus Christi's Jonathan Singleton, the Astros' top prospect, in the outfield. Tulsa's Lars Davis and San Antonio's Ali Solis were voted the top catchers, while a trio of Cardinals -- Keith Butler, Seth Maness and Trevor Rosenthal -- were voted among the league's top pitchers.